The special events guys were scrambling around trying to get the Alberta Building Trades Field ready for the Career Fair & Open House; there had been a miscommunication about the start time which forced them into hyper-drive much earlier than they expected. Vendors were pouring in, even in the last 15 minutes before the scheduled 10 am start time, as the line-up of eager job and education seekers was starting to stretch down the long hallway. The buzz of energy was positive, anticipatory, hopeful. This event, which happens over two days, is a microcosm of what happens at Keyano College every day. People come here to find ways of achieving dreams, whether that is by upgrading their education, earning a special designation or certificate, or getting that coveted diploma, degree or apprenticeship. It's a special place to work because we get to offer that integral step up to thousands. Two young unemployed gentlemen showed up early and offered to volunteer with the set-up; there are never enough hands on deck when you are trying to put the finishing touches on a major event. By 10 am they both had jobs. A long time resident of Fort McMurray was recently laid off and decided to come to the Career Fair in hopes of finding some hope. He found it, and left, leather satchel in hand, with more than one strong lead. A young lady straggled in toward the end of day one, searching for a way to move from administrative temp jobs to something closer to that penultimate opportunity, the one that would lead to her dream job. I was tasked with being a guide, of taking groups of students on the "general" tour of the College, sweeping from the Theatre & Arts Centre through Elements and the Bookstore, down the Office of the Registrar and Library corridor up through the science wing into the Syncrude Technology Centre and back to the Syncrude Sport & Wellness Centre via the Trades labs. The students from Father Mercredi and Composite high schools were great: attentive, interested, and intent on getting the best sense that they could about the College and campus life, compressed into less than an hour. The staff of Keyano College were out in full force for this event, working hard, smiling, and making several thousand guests feel welcome. It was fun to watch my staff excel, (Andrea, Renee and Alanna) as they were on the front lines, near the entrance to the displays, welcoming visitors, putting out fires and sending groups out on their various tours. Their professionalism and dedication reminds me of how grateful I am for the people I get to work with everyday. 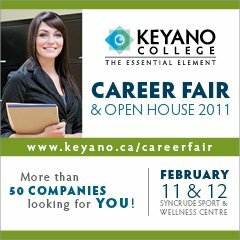 So, as employers get ready to reach out and meet potential hires and as Keyano staff members prepare to link people with careers through education, the Career Fair & Open House heads into its second day.